Lansfordite is a hydrated magnesium carbonate mineral with composition: MgCO3·5H2O. It is a soft monoclinic hydrated magnesium carbonate mineral. It is a mineral composed of a hydrous basic carbonate of magnesium like paraffin when first taken out of the ground but altering to nesquehonite on exposure. Landsfordite was discovered in 1888 in a coal mine in Lansford, Pennsylvania. Color: Colorless (fresh), white (exposed); colorless in transmitted light. 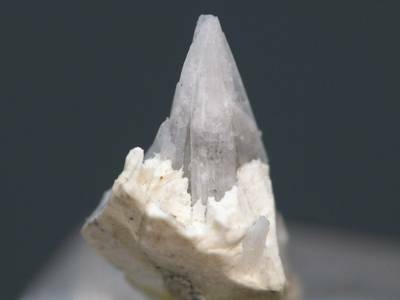 It crystallizes in the monoclinic system and typically occurs as colorless to white prismatic crystals and stalactitic masses. 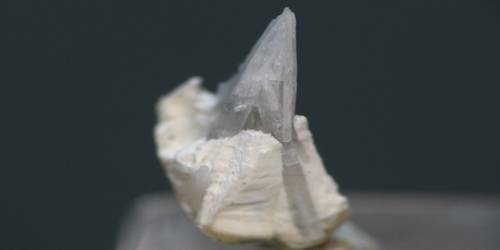 It is a soft mineral, Mohs hardness of 2.5, with a low specific gravity of 1.7. It is transparent to translucent with refractive indices of 1.46 to 1.52. Occurrence: Stalactites pendant from the shale roof of an anthracite coal mine (Nesquehoning, Pennsylvania, USA); in a hydromagnesite deposit (Atlin, Canada); a weathering product of an ultramafic body (Sør-Trøndelag, Norway).